If you’re looking to mix things up this Valentine’s Day, treat your sweetheart to the ultimate Valentine’s Day getaway to Myrtle Beach at Marina Inn at Grande Dunes! Our exclusive Valentine’s Day Package is perfect for couples who are looking for the most luxurious and unforgettable experience in Myrtle Beach! Available February 14th – 16th, our Valentine’s Day Package rates begin at $240 per couple and include a three-day weekend getaway in one of our romantic guest rooms. Escape to our oversized guest room featuring a king bed, two cozy cotton bathrobes, imported cotton bed linens and even a private balcony with beautiful scenic views of the Intracoastal Waterway. The bathroom offers impeccable furnishes such as travertine tile floor and a rain shower head for a relaxing experience during your stay. For those who’re dreaming of a true fairytale weekend, add extra nights, a couple’s massage for two and breakfast for two when you call to make a reservation! Fun Fact: Valentine’s Day is the 2nd most popular holiday to dine out, only behind Mother’s Day! 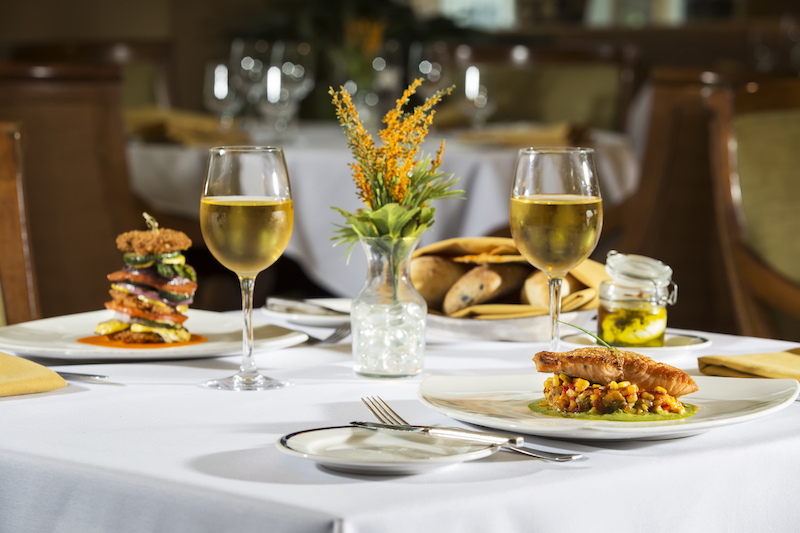 Make that special someone in your life swoon with a romantic evening in Myrtle Beach at our very own on-site restaurant, WaterScapes. Our exclusive Valentine’s Day menu will be available for 3 nights, Thursday (Valentine’s Day), Friday and Saturday from 5:30 p.m. to 9:30 p.m.. And remember, with our Valentine’s Day Package your dinner is included. The menu was crafted by our head chef at WaterScapes and includes a whopping five courses! For starters, our romantic Valentine’s Dinner menu features two courses of soup, scallops, and salad. For the entree, choose from wild-caught seared salmon or a juicy filet mignon and top off the dinner with a chocolate pate or a warm berry clafoutis. Make some memories during your romantic getaway to Myrtle Beach! Take a walk along the beach and snap a sweet selfie with your Valentine. Catch a morning sunrise or a glowing beach sunset to end the day. Some of the best views can be found at the top of the Myrtle Beach SkyWheel located along Ocean Blvd, only minutes away from Marina Inn. Head to The Market Common to take advantage of their complimentary horse-drawn carriage rides or spend the afternoon tasting wine at Duplin Winery. If you’re ready for a sweet getaway, book now for an unforgettable Valentine’s Day in Myrtle Beach at the one and only Marina Inn at Grande Dunes! Previous PostPrevious Top Golf is Coming to Myrtle Beach!